The foundation of our company is our local online database. The data in our various credit reports provides our clients with live up-to-date information which enables them to assess their existing clients, potential clients and suppliers so that they can continue to trade, safely and securely. Our database is accessed by subscription and is designed to match our client’s needs. The information is presented in an easy to read format through which clients can easily search for the required information to facilitate a more detailed and better decision-making process helping businesses reduce the amount of commercial risk they may venture to take. It is a simple and easy to use risk management tool that enables inquiries on data subjects through a set of various credit reports, which comprise information and other data that is focused on the needs of a modern day business. Our databases are regularly updated and sourced from various private and public resources, such as the Electoral Registry, Registry of Companies, and Law Courts, all in strict compliance with the data protection laws. Should I offer credit terms? What credit terms should I give? Will I get my goods I paid for? What are Creditinfo Credit Reports Used For? The Creditinfo Credit Reports are to be used as tool in lending decisions. They provide the basic information required to aid a creditor to open or extend credit to a prospective or existing client. Credit Reports may also, therefore, be used as a tool to increase sales. Creditinfo Credit Reports do not cover consumers or sole traders. What does a Creditinfo Credit Report contain? Creditinfo Credit Reports contain information on companies obtained from official sources, in order words, filed information, such as, date of registration and number, registered address, available telephone and fax numbers, available web site and email address, available vat number, the latest directors and shareholders, company secretaries, capital structure, activities and the latest three years financials on which is based the Financial Strength Indicator and the suggested Credit Limit. What are Financial Strength Indicator and suggested Credit Limit? It is easier for creditor to refer to the Financial Strength Indicator and suggested Credit Limit than to sift through the report manually, reaching decisions much more quickly and reducing problems from discrimination. However, the Financial Strength Indicator and Credit Limit are only to be considered as guidelines since, besides other current considerations, both are based on the latest financial statement filed, which, on average, is about one to two years old. On what criteria is the Financial Strength Indicator based? The Financial Strength Indicator is based on a range of financial net worth values. The lower end of the range is defined with the letter ‘H’ whilst the higher end of the range with the letter ‘A’ and the prefix ‘5’. The higher the net worth, the higher the indicator. Also associated with these groups of ranges is a general risk indicator. On what criteria is the suggested Credit Limit based? 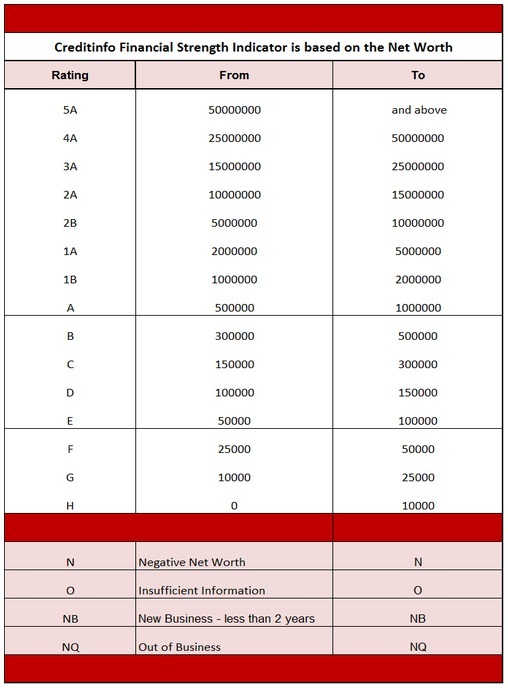 The Credit Limit is also based on the latest financial net worth of the company but it also takes into account various other factors, such as, the age of the company, the age of the latest financial statements, negative registrations, etc..
Are the Financial Strength Indicator and the Credit Limit to be considered separately? Both indicators are be considered and evaluated together. The reason is amplified by the following example: a company with a net worth of Eur100,000 and a credit limit of Eur1,000 is clearly not in the same situation as a company with a net worth of Eur10,000 and a credit limit of Eur1,000 – the former requires more investigation. Should a Creditor base his decisions solely on the Financial Strength/Risk Indicator and Credit Limit indicated? The conclusions reached in the Credit Report are only indicative and should not be the only basis for reaching decisions. Ideally, the Creditinfo Credit Report should be used as an external tool to compliment internal credit granting parameters. Is a Creditinfo Credit Report freshly investigated? The Creditinfo Credit Report contains, and is based, on data that is automatically available from on-line sources and there is no manual intervention. Should a creditor feel that there is scope for further investigation, Creditinfo Malta also provides freshly investigated credit reports that incorporate more analysis of the data subject, although this does not guarantee any change in the conclusions reached previously. Can a Financial Strength Indicator and a Credit Limit be reviewed? If a company has more recent audited financial statements on which fresh calculations may be made, then both the Financial Strength Indicator and the Credit Limit may be reviewed.